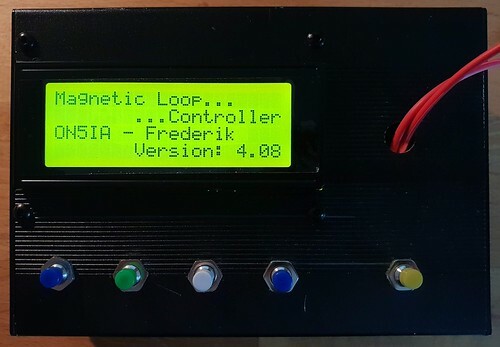 The Automatic Magnetic Loop Tuner can be used with a variety of transceivers, from the most common brands like Yaesu, Elecraft, Kenwood and of course Icom. I recently acquired an IC-7300 and since many ham’s love and own this radio, I’ll quickly show you what settings you need to enter to make it “talk” with the Automatic Magnetic Loop Tuner. First we do the setup on the IC-7300. On the transceiver, push the menu button. Next press the “SET” button on the touchscreen. Select “Connectors” and “CI-V” in the two following screens. No we switch to the Automatic Magnetic Loop Tuner, and press the Menu / Enact button for more than 1 second. Select the “Radio Type” menu item. Choose for ICOM CI-V Poll in the Tranceiver Type menu. The value will be saved in the memory and you’ll return back to the Config Menu. Now select “ICOM CI-V Addr” and set the value to 94. Next, we set the SerialPort Mode to TTL, and the SerialData Rate to 19200 b/s. Exit, the menu, and if everything went wel, now your Automatic Magnetic loop tuner follows the VFO of your IC-7300, and you can use the auto tune function to set the radio in transmit mode and let the tuner hunt for an acceptable SWR. I was trying to fit the automatic magnetic loop tuner into a smaller enclosure. It was only a partial success. There is plenty of space for the display and buttons on the front, but I have to choose between the SWR bridge or the rotary encoder. This however is not an option. They both need to be present in the automatic magnetic loop tuner. So the only possibility I see for the moment is to look for a smaller box to accommodate the SWR bridge. If I can’t find a smaller box for the SWR bridge, I’ll probably have to stick with the larger Hammond enclosures. I also used a green display instead of the blue ones I usually use. What’s your favorite color? Everything you need to build the automatic magnetic loop tuner in just one picture. On the Flickr page you can see the annotations. To reach the Flickr page, you need to click on the picture. 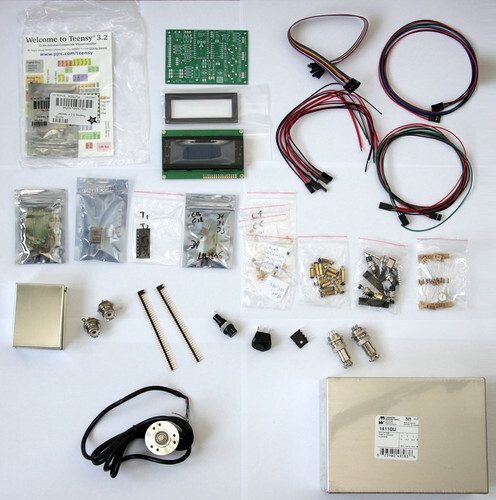 Adafruit has dedicated an interesting blogpost about stepper motors. Click on the link below to learn all about stepper motors. I took some time to solder another PCB for an Automatic Magnetic Loop Tuner. I made some pictures of the final result which I would like to share with you. This is a view from the top of a populated PCB. The Teensy 3.2 and the A4988 stepper module are not yet installed. This loop controller won’t need the end stop feature. Therefor D2, D3, R25, R26, C19, C20, C21, C22, T3 and the 3 pin header for the end stop connector, are not installed. C1 is located underneath the Teensy 3.2. This capacitor can be soldered upright. There is plenty of space, so no need to lay it flat on the board. Here we have both the Teensy 3.2 and the A4988 stepper module installed. Note that a jumper is placed over JP1, but that JP2 is left open. JP1 connects “Sleep” and “Reset”. JP2 is for future use. 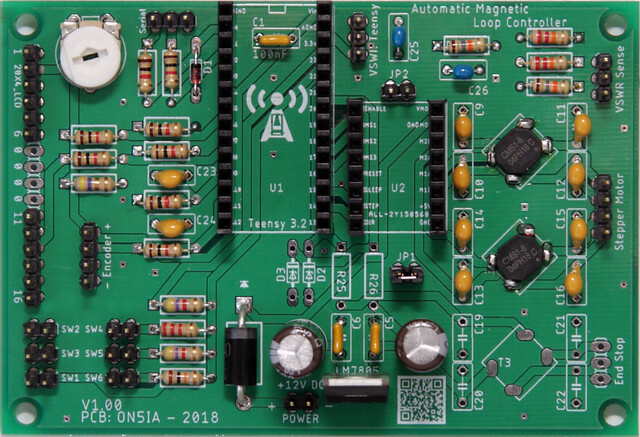 When using a DRV8825 stepper module it gives us the possibility to connect the unused Teensy 3.2 pin 19 with pin MS3 of the DRV8825. With some additional programming to the software, this could enable the 1/32 step stepper resolution. This however has not yet been programmer, nor tested. If there is one thing I would change to this board it’s the re-positioning of the LM7805 voltage regulator. The ground plane in facing inward which makes it difficult to attach a heat-sink. This can be solved easily by bending the legs of the LM7805 so the ground will face upwards, or by connecting it from the underside of the PCB and connecting the ground to the metal enclosure the whole PCB will be put in. Using the original schematic as a starting point, I reworked the electric diagram and incorporated a A4988/DRV8825 module. JP1 connects the sleep and reset pins of the A4988/DRV8825 module board. I’ve seen schematics where these pins are soldered together, but I preferred to use a jumper. This way you have the possibility to add a reset switch, or if you think it’s not needed, just bridge the two contacts. JP2 was incorporated for future use. It connects the unused pin 19 of the Teensy 3.2 with pin MS3 of the A4988/DRV8825 module. Without this connection, the maximum resolution of the magnetic loop controller is 1/8th step. With some extra coding, we could drive the stepper motor as precise as 1/16th step (with the A4988) or even 1/32th step (with the DRV8825). This coding is not yet done, and I’m also not sure if this fine stepping is useful for this project, but I thought it was a nice idea to experiment with it. So for now, you can leave JP2 open. If you are not using end stop switches,then there is no need for D2, D3, R25, R26, C19, C20, C21, C22 and T3. Depending on the type or brand of rotary encoder, the A or B phase can be reversed. However, the VCC and G must always be respected. You can check the correct wiring of A and B when you scroll through the menu. Turning the rotary encoder clockwise must increase the menu option, the steps and the frequency. When this is correctly done, you can start checking the wiring of the stepper motor. In order for the backlash and auto-tune function to work correctly, the capacity must go down, when you turn the rotary encoder clockwise. Don’t need the SWR / power meter function? Then you don’t need R15, R16, R17, R18, C25, C26 and R20, R21 and R22 (and their corresponding switches) either. For any inquiries or questions about the PCB, please send an email to on5ia@uba.be. Add my email address in your contacts to prevent my response email from landing in your spam folder. The design Loftur published on the project site was built around two A4975SBT ic’s. Although they are available at digikey.com they are rather expensive if you only need 2. Mouser.com even doesn’t have them in stock. When you need more of them to build multiple automatic magnetic loop tuners, you could start looking for them on AliExpress. A starting seller (who needs good reviews for credibility) will offer you 10 pieces for less than 12 euro. They have a 1,5 A continuous output current and have a step sequencing from 1 full step until an eighth of a step. When you are using a multi turn variable vacuum capacitor or any capacitor connected to a geared motor, this will do just fine. If the steering cable is too long, and it’s resistance is becoming too high, you need to provide more than 1,5 A so your motor would still receive enough current to generate sufficient torque for turning the capacitor. Depending on the type of capacitor, you might need more than 1/8 of a microstep. In both cases you should look out for something more powerful or precise than the A4975STB’s. 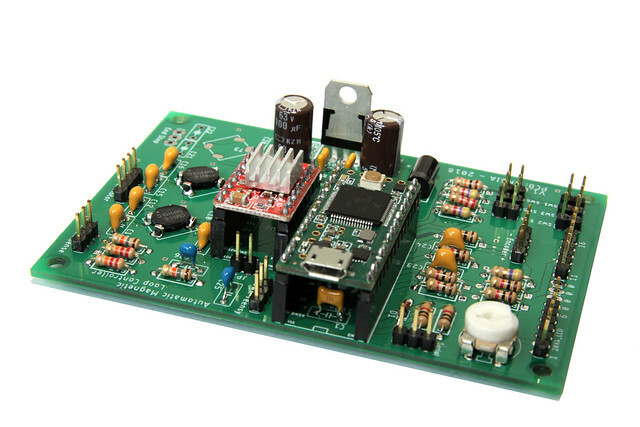 Two alternative stepper driver modules are the A4988 or the DRV8825. On top of being more precise and / or more powerful, they are more easier to find and a lot cheaper than two A4975STB’s. 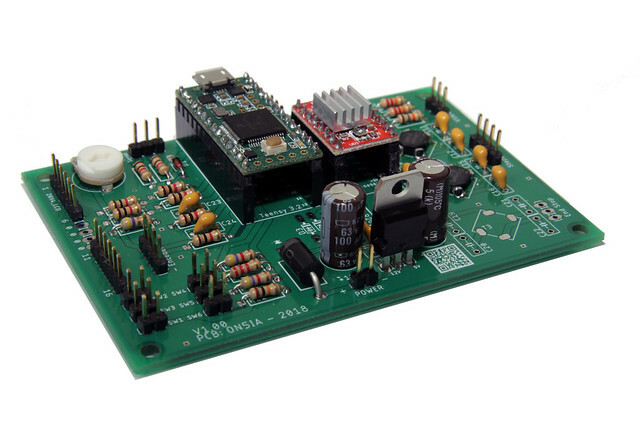 Just like with the NEMA 17 stepper motors, these modules are widely used in all kinds of 3D printers and DIY CNC machines. There are plenty of suppliers on AliExpress, offering them for prices close to one euro. The A4988 is capable to deliver 1A per phase without a heat sink or forced airflow and is rated for 2A per coil with sufficient additional cooling. On top of all kinds of over- and under-protection intelligence (voltage, temperature, current, crossover-current, short-to-ground and shorted-load) it features five different step resolutions: full-step, half-step, quarter-step, eighth-step, and sixteenth-step. 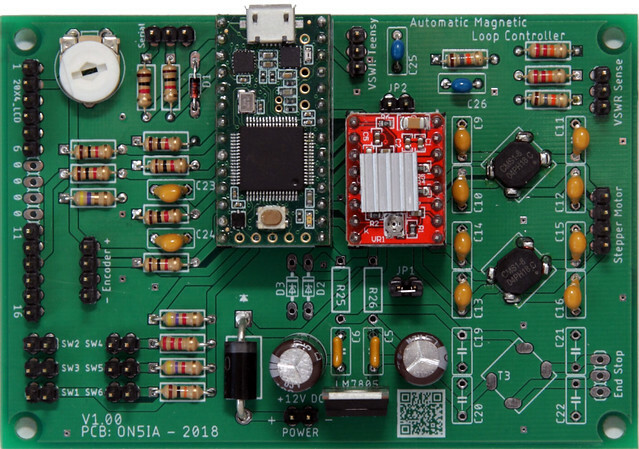 The DRV8825 has a pinout and interface that are nearly identical to those of the A4988 stepper driver module, so it can be used as a higher-performance drop-in replacement for those modules in our automatic magnetic loop tuner. It can deliver up to approximately 1.5 A per phase without a heat sink or forced air flow and is rated for up to 2.2 A per coil with sufficient additional cooling. It will not sound as a surprise to you when I tell you these two modules don’t fit in the original PCB layout Loftur designed. Joerg, a user in the loop controller yahoo group found a solution for that and made an adapter board to use a A4988 or DRV8825 module with Loftur’s print. 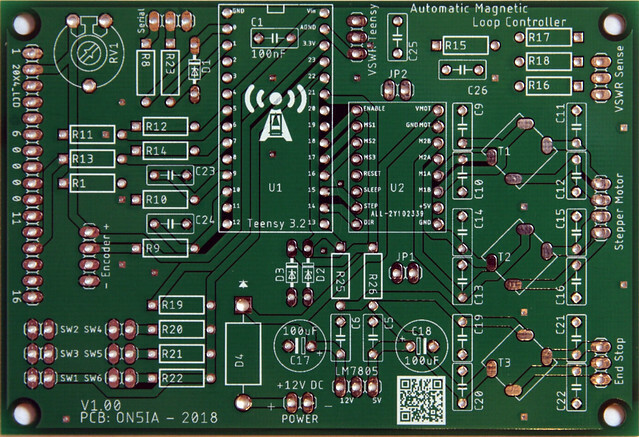 Joerg made me realise it wouldn’t be to difficult to adapt the original design and make a new PCB especially for the A4988 or DRV8825 stepper driver modules. After some hours redrawing the schematics and moving around the components I came up with following PCB design. 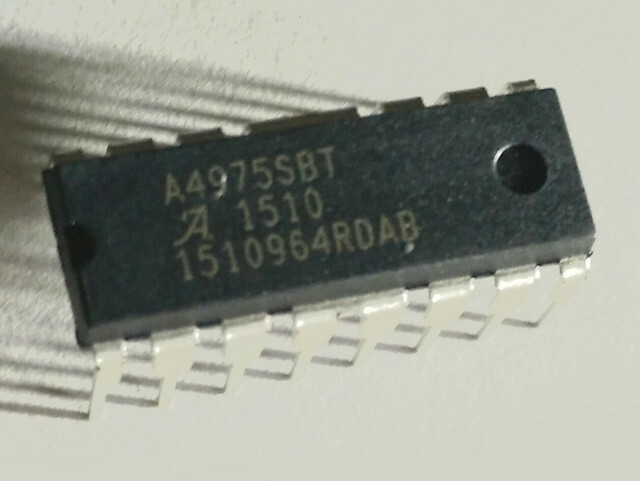 It’s 67mm x 100mm and features besides the space for a A4988 or DRV8825 module, 3 (T1, T2 and T3) 2.2 A common mode chokes (CMS1-8-R). Loftur proposed these chokes as an upgrade for the 1 A common mode chokes of Wurth Electronics (744227S) originally used in his first design. The rotary encoder is the most expensive part of the automatic magnetic loop tuner. It’s a little more expensive than the Teensy 3.2. Those of Bourns cost around 23,21 euro VAT excl. for the 64 ppr version without an incorporated push button. 64 ppr is the lowest resolution you should look for. If you go lower than 64 ppr you’ll have to turn around the encoder many times before you get to the desired stepper position for the right capacity. You could always look for rotary encoders with a higher resolution. In the software you can define how many pulses need to pass before the stepper motor makes a micro step. The ENC_MENURESDIVIDE variable is used to limit the scrolling speed in the menus. When using a 128 ppr encoder, use 16, with a 64 ppr encoder choose 8. The ENC_TUNERESDIVIDE variable is used to determine the stepper motor response. When using a 128 ppr encoder use 2, with a 64 ppr encoder use 1. This translates into the following: one full (360°) turn of the rotary encoder results in 8 menu steps or 64 micro-steps. On AliExpress you can find 400 ppr rotary encoders for less than 10 euro. Since we know our math, we only need to changes the ENC_MENURESDIVIDE and ENC_TUNERESDIVIDE variables to respectively 50 and 6 (or 7), to use this cheaper alternative. These 400 ppr rotary encoders are a lot bigger than the 64 ppr Bourns rotary encoders. Functionally they will do just fine, but you need to take into account the extra space that the rotary encoder will occupy in your project box. CQ field day, CQ field day, this is ON5IA/P. The proof of the pudding is in the eating, as they say, so what better way to test the Automatic Magnetic Loop Tuner than to participate in a field day? The weather forecasts looked promising so I decided to subscribe myself for the Region 1 SSB field day of September 2017. The rules for the field day are simple: you’ll have to setup a portable station, and you can only start with the setup 24 hours before the beginning of the contest. In our case we didn’t even need that much time. One hour before the contest, we unloaded the magnetic loops and installed them. A thick plastic tube was hammered in the grass, and the magnetic loop foot was shoved into it. We attached the coax- and the stepper motor steering-cable, hooked them to the radio, attached the batteries and we were QRV. There were still 30 minutes left before the start of the contest. After configuring the automatic magnetic loop tuner, we still had 25 minutes left HI HI. As we wanted to test the automatic tuning capabilities of our tuner, we actually never called CQ. Fixing yourself to one frequency and calling CQ for an hour will not learn you anything with regards to the automatic tuning possibilities, of loop controller. Instead we started at the bottom of the band and scrolled up until we reached the first OM calling CQ. When the contact was made and the signal report and numbers were exchanged, we moved to the next OM. When we reached the top of the band, we scrolled down again and picked all the stations we didn’t hear the first pass. As the time passed, band conditions changed. When we moved up and down twice, we switched band. We applied the same tactics on each band. It’s not a great contest tactic, but we did not participate in the field day to win the first price, but to test our automatic magnetic loop tuner. The tuner did a fabulous job. We only had a hiccup once, when the mechanical coupling between the stepper motor and the capacitor broke loose. We subscribed to the 12 hours open all band category, so we were obliged to take our times off. Here again, we didn’t plan them tactically to win the contest, but to strengthen our inner man. We had a tasty BBQ and a great sleep. Next day we continued our testing. When we reached 120 contacts our pre-printed logbook was full and we called it a day. 45 minutes later, everything was packed as if the field day never took place. But these were only the claimed scores! When final results were known, we moved up two places to the 3rd place. Yeah, that’s a bronze medal. I found it remarkable that some stations lost so may claimed QSO’s so I started to calculate the ratio between claimed and final scores. BOOOM, gold medal for ON5IA/P! With a correctness of 96,67% we had the best claimed/final-ratio. 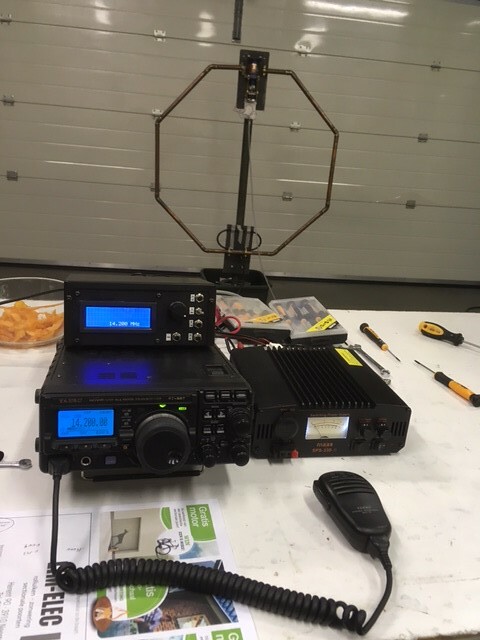 This can be understood in two ways: 1 we are superbe operators, or 2 our magnetic loop antennas gave us the big advantage of having less QRM and a better readability. This test made me conclude that the magnetic loop antenna is indeed a very good antenna if you don’t have much place to put op a big tower, or if you live in an environment with a lot of QRM. You can have as much fun as all other OM’s and you don’t even need to skip the contests. That is, if you have a solution for the biggest drawback of the magnetic loop antenna: it’s small bandwidth due to the high Q factor. And we have this solution: the automatic magnetic loop tuner! On the 15th of March last year, we were ready to test our final product. The Automatic Magnetic Loop Tuner was fully assembled, programmed and connected to the antenna and transceiver. Time to turn the VFO around and see if we can make some contacts. On top of that, the antenna setup is the one from the picture below. Inside the workplace, 1m apart from an aluminum garage door, steel beams in the roof. I don’t have to explain to you the disbelieve of the second OM, who immediately grabs the mike and calls for K2GAV. K2GAV returns but the signal is getting weaker. A new contact is made, however this time with a report of 56. This antenna setup, the timing and the conditions were all but ideal, yet we managed to make a DX contact! This proves that the Magnetic Loop antenna is an ideal antenna for people with little space to put a big antenna. You don’t need to say your favorite hobby goodbye if you have to move to an apartment. Long live the magnetic loop antenna and the Automatic Magnetic Loop Tuner! so I can inform you on new developments. @lvandevenne Dat hangt ervan af of je de vermogenswinstbelasting voor of na de verkiezingen bekijkt.